3) The voter’s last four digits of the Social Security number and date of birth. BTW, could somebody please define “strengthen”? 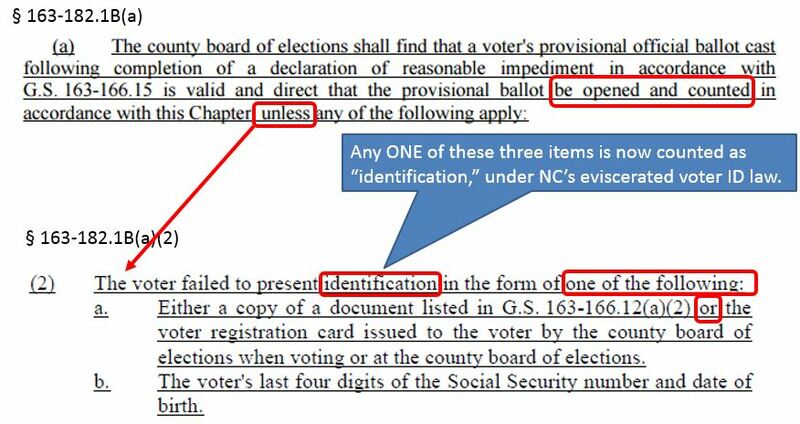 Before we discuss the easy correction to this particular loophole in this new Swiss cheese defense against organized systematic vote fraud, we need to counter the shameful propaganda that said, in part, that HB 836 “strengthens” voter ID in NC. We would love to have somebody explain how it strengthens the electoral franchise when any voters can walk in and use any excuse under the sun as a reason they couldn’t get their FREE voter ID card and the only “identification” they’re required to present is a DOB and the last four digits of their Social Security number (SSN-4)? By this standard, anybody could conspire with any former NC voter (who now lives out-of-state) simply by obtaining the voter’s DOB & SSN-4 and, maybe, the proper name and address they used. Bottom line: HB 836 makes it easier to vote fraudulently now than it was before any photo ID at all was required under the comprehensive reforms to election law (HB 589) enacted, just two years ago! Back in the “good old days,” a fraudulent voter only needed to generate a piece of paper that resembled a utility bill, a bank statement or some sort of official-looking government letter (commonly called HAVA IDs”). Now, they only have to provide a voter’s date of birth and the last four of their Social Security number. If they’re somehow caught, conspiracy to commit vote fraud is a misdemeanor under NC sentencing guidelines and Vote fraud is so low a felony that we have a very difficult time convincing District Attorneys to prosecute them. In its current form, HB 836 only “strengthens” those seeking to commit the perfect crime. Require all RID voters to provide their DOB and SSN-4 along with either the voter registration card or the HAVA ID card. This alone will not solve every concern, but it’s a good start! For a catalog of all VIP concerns regarding HB 836, please click here.